Greenaction Unites Communities & Tribes Up and Down the Colorado River to Protect Our Rivers, Watershed, Health & Environment! Moab, Utah – A large delegation of tribal leaders and Mohave Elders from the Colorado River Indian Tribes traveled hundreds of miles from their home in Parker, Arizona all the way to Moab, Utah to join with local residents during Earth Week to call for a halt to the pollution and water depletion threats to the Green and Colorado Rivers and the entire Colorado River watershed. Greenaction helped bring together the Colorado River Indian Tribes with other indigenous activists from Arizona and California and southern Utah residents who also are threatened by dirty energy production including the explosion of fossil fuel drilling and fracking, the tar sands mine under construction in the Book Cliffs, and uranium mining and milling. Both the Colorado River Indian Tribes and the Fort Mojave Indian Tribe have passed tribal council resolutions opposing the proposed Green River nuclear power plant. 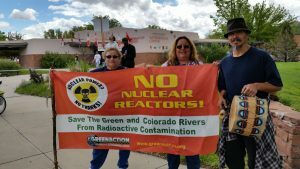 These Native Nations who have lived along the Colorado River since time immemorial are alarmed at the prospect of the radioactive threat posed by a nuclear power plant near the Green River which flows directly into the Colorado River. On April 24, about 150 people attended the Community Forum at the Moab Arts and Recreation Center with tribal leaders, Elders, and community organizers confronting dirty energy production and climate change threats to the Colorado River Watershed. The program began with traditional Bird Songs sung by a young Mohave from the Colorado River Indian Tribes. On Saturday, April 25. over 100 people rallied and paraded along Main Street to bring these profound pollution threats to the attention of the thousands of tourists, local residents, businesses and government officials. The rally and parade was followed by a ceremony at the Colorado River. These events were sponsored by Greenaction for Health and Environmental Justice, Living Rivers, Uranium Watch, Colorado River Indian Tribes, White Mesa Concerned Citizens, La Cuna de Aztlan Sacred Sites Protection Circle, Canyon Country Rising Tide, Peaceful Uprising, Sierra Club Glen Canyon Group, Clean Up The Mines.